Share Information, Express Ideas, and most important of all put a smile on your face. Cars like this usually stay at the concept stage indefinitely. 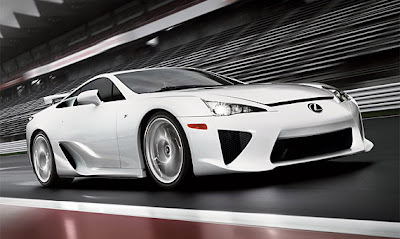 But the Lexus LF-A ($375,000) will be built in 2010 and can be parked in your garage this time next year. Powered by a lightweight (aluminum alloy, magnesium alloy and titanium alloy) 4.8-liter V10 engine, this rear-drive, two-seat supercar pushes over 550 horsepower and a 0-60 time of 3.7 seconds with a top speed of 202 mph. Only 500 will be produced worldwide. To go to the website and build your own LF-A Click Here.